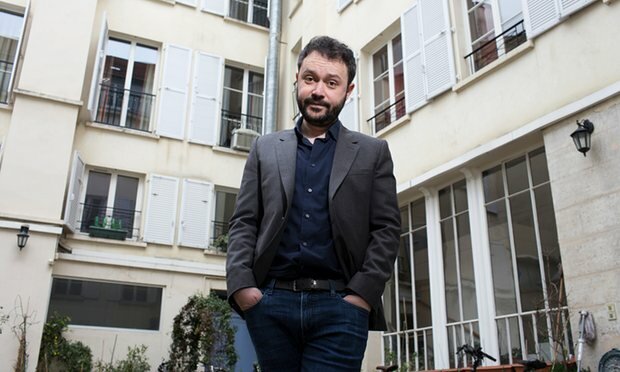 Riad Sattouf, Franco-Syrian creator of the universally lauded graphic memoir The Arab of the Future, is an uneasy symbol of the intercultural tensions currently roiling Europe and the Middle East. A longtime contributor to Charlie Hebdo and until 2014 the magazine’s only regular cartoonist of Arab descent, he has frequently been asked to explain issues he cannot comprehend himself. In a recent interview with The Guardian’s Rachel Cooke, he discussed his survivor’s guilt after the Hebdo massacre and his sense of belonging in the international community of cartoonists. Sattouf first drew the attention of Charlie Hebdo when a private citizen filed a complaint with a rarely-used censorship board for children’s literature regarding his books Manuel du puceau (Manual for Virgins) and Ma circoncision (My Circumcision). The challenge was not prompted by the titular subject matter, but by alleged anti-semitism in the two books. At least in the latter case, a memoir of the author’s own circumcision carried out in Syria when he was eight years old, the “anti-semitism” is directed at Sattouf by schoolyard bullies, even though neither he nor his parents are Jewish; the bullies simply know that he’s different due to his fair hair and poor Arabic, and have been raised to believe that “Jew” is the worst insult imaginable. In context this scenario, which he also recalls in The Arab of the Future, obviously is intended to highlight the absurdity of all forms of othering including anti-semitism, but the complainant alleged that the books should not be sold to minors. When I was a teenager I decided to choose for myself another people. I refused France, and Syria. I chose cartoonists. When I meet cartoonists from Japan or Russia we have the same problems, the same ideas. This is true, and I feel it very deeply. Read the full interview with Sattouf here. The first English-language volume of The Arab of the Future is out now, and the second will be released on September 20.